Sir Ponnambalam Ramanathan designated as ‘the greatest Ceylonese of all times’ by D. S. Senanayake, the first Prime Minister of independent Ceylon, was born on 15th April 1851, and passed away on 30th November 1930. He dominated the public life of this country like a colossus for well over 50 years during the last quarter of the 19th century, and the first quarter of the 20th century, as aptly stated by Dr. C.W.W. Kannangara, a senior Cabinet Minister. His 75th death anniversary fell on 30th November 2005 and his 155th birth anniversary will fall on 15th April 2006. He was a lawyer par excellence, a legislator of the highest probity championing the causes of all communities in the Island and a highly cultured philosopher-statesman, as envisaged in Plato’s ‘Republic’ and a devout spiritual seeker. He was enrolled as an Advocate in 1873, and enjoyed a lucrative practice at the Bar until 1886. The Governor nominated him to the post of Unofficial Member of the Legislative Council in 1879, on the retirement of his illustrious uncle Sir Muthucoomaraswamy. (who himself was an international figure, having been knighted personally by Queen Victoria at Buckingham Palace in London, for his services to the comity of nations, and who was the father of Ananda Coomaraswamy, the well known international scholar). Ramanathan functioned as an Unofficial Member of the Legislative Council until 1892 and was hailed as a doughty fighter for the rights of all communities in the Island. He was then appointed by the Governor as Solicitor-General in 1892 and functioned as such until 1906, and acted as Attorney-General on several occasions during this period. He availed himself of this period of service as a senior Law Officer of the Crown to introspect and produce very illuminating writings on Christian and Hindu spiritual themes. The Governor at that time Sir Henry Blake was so impressed with the depth of his spiritual writings, that he gave him one year’s leave from 1905 to 1906 to go on a lecture tour of USA to deliver talks on spiritual topics at the request of over 200 signatories to an invitation, calling upon him to enlighten the intelligentsia in the United States, in the wake of Swami Vivekananda’s spiritual awakening of the people of America 12 years earlier, in 1893 at the World Parliament of Religions. Ramanathan entered active politics again in 1911 on being elected by the people as the first Educated Ceylonese Member of the Legislative Council of Ceylon by a sweeping majority. It was a historic event, as he was the very first candidate to be elected to the Legislature of the country by an all-Ceylon electorate, prior to the introduction of universal franchise in. 1931 under the Donoughmore constitution. He was re-elected to this seat in the Legislative Council in 1916 and held it until 1921. Ramanathan was not only steeped in Hindu and Christian mysticism, but was deeply involved in the revival of Buddhist activities in Ceylon. He was responsible for the Government declaring Wesak a public holiday, and was closely associated with Col. Henry Olcott, the co-founder of the Theosophical Society, in promoting Buddhist education in schools. Olcott had said ‘From the time Buddhists of Ceylon began to take into their own hands the education of their youths, we have had a staunch friend and co-operator in the person of my friend Mr. Ramanathan, the Solicitor-General of Ceylon’. Sir Baron Jayatilaka, the Head of the Cabinet in the State Council, referred to Sir Ponnambalam Ramanathan on one occasion as ‘the greatest man Ceylon has produced during the past 50 years.’ (The writer had the good fortune of meeting Sir Baron at a Colombo University Students’ Union dinner in 1940 where the writer as the Chairman happened to receive and toast Sir Baron as the Chief Guest at the dinner). A. Ratnayake, President of the Senate, (whom the writer knew personally, as his home at Frankfurt Place, Colombo, was the venue for several J. Krishnamurti group discussion meetings organized by the writer) once described Sir Ponnambalam Ramanathan as ‘the father of Ceylonese Renaissance’. It is reported that during the widespread and prolonged Sinhalese-Muslim Riots of 1915, the British Governor came down with a heavy hand on the Sinhalese community and declared Martial law and ordered the Police and the Army to arrest and imprison several prominent Sinhalese leaders. Among those imprisoned were D. S. Senanayake, D. R. Wijewardena, Dr. Cassius Pereira, E. T. De Silva, F.R. Dias Bandaranaike, H. Amarasuriya, A.H. Molamure and several others. It is said that some other leaders were shot without trial. Ramanathan thereupon came to the rescue of the Sinhalese community and fought hard and long against the tyranny of the British Government. Anagarika Dharmapala who was in India at that time wrote to Ramanathan thanking him for his valiant efforts in pressurizing the Government to do justice to the Buddhists of Ceylon, both in and outside the Legislative Council, and requesting him to persevere with his agitation. Ramanathan then made a special trip by ship to England, in October 1915, braving the German submarines that were attacking British ships at that time during World War 1, and made cogent representations to the Secretary of State for the Colonies in London and to several British Parliamentarians and politicians, and had the Governor and the Army Brigadier recalled and replaced, and all the Sinhalese leaders duly released from prison. When he returned to the Island, Ramanathan was given a hero’s welcome at the jetty by a grateful public, A. E. Goonesinghe and Lionel (later Sir John) Kotalawela and a few others went on board the ship to receive him and later as A. C. Seneviratne, a prominent Sinhalese, related ‘No horses, but relays of men thirty number drew his carriage through the streets to his residence at ‘Sukasthan’, Ward Place, Colombo, as a mark of deep gratitude’. Among these grateful men who drew the carriage were some of the elite in the Sinhalese community. As regards to his personal life, Ramanathan married Chellachiammal, daughter of Nannithamby Mudaliyar, a wealthy businessman of Colombo, in 1874 and had two sons Rajendra and Varnadeva. He was awarded the prestigious title of C.M.G (Commander of the Order of St. Michael & St. George) by the Imperial Government in 1889, and was made a King’s Counsel in the legal profession in 1903. He was conferred a Knighthood by the Imperial Government in 1921. After the death of his first wife, he married in 1906 an English lady by the name of Miss. Harrison, who was his devoted secretary during his American lecture tour and who later came to be known as Lady Leelawathy Ramanathan, and was Principal of the Ramanathan Ladies College in Jaffna for several years after Sir Ramanathan’s demise. Their only daughter Sivakamy later married Natesa Pillai, a very cultured person of Indian origin, who became a Member of Parliament in Ceylon, (and whom the writer had the good fortune to meet and get to know personally). 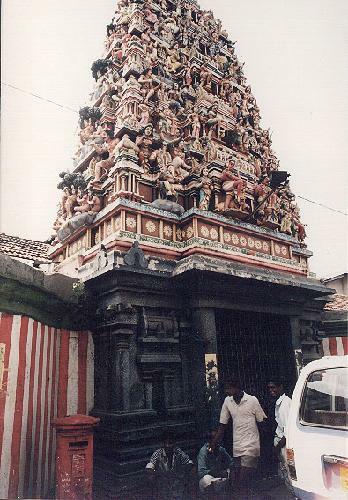 The Ponnambalavaneswara Temple at Kochchikade, Colombo, was originally built by Ramanathan’s father in 1856 out of brick and mortar. Ramanthan demolished it in 1906, and he built a new splendid granite temple with delicately carved rockstone pillars and images on this site between 1907 and 1912 at a cost of two million rupees. He also later built two small temples at the Ramanathan Ladies College campus at Chunnakam and at the Parameswara Boy’s College campus at Tinnevely, Jaffna, both founded by him, the great Philanthropist that he was. The writer, who is now 86 years old, had the good fortune, as a schoolboy of 11 years, to listen to one of the last talks of Sir Ponnambalam Ramanathan at the Saiva Maha Sabha hall at Kandy in 1930. One still vividly remembers the stately turbaned figure of the speaker beginning his English speech with a rendering of Saint Manickavasagar’s famous Tamil hymn: ‘Muthineri Ariyatha Moorkarodu Muyalvenai’ and explaining how the saint ‘in an ecstatic mood marvels (Achovey), at the way the Lord so graciously purifies his mind of all the dross and grants him ineffable joy and liberation.